At best Blackberry can hope that their new Z10 smartphone can retain fans that haven’t fled yet into the arms of Apple’s iPhone 5 or one of the flagship Android phones. Although it is the best touchscreen smartphone that Blackberry has made, none of the features stand out as world beaters and some are still sub-standard compared to iPhone and Android. What Blackberry needed was for their newly launched Z10 smartphone to be a showstopper, catching the eye of potential buyers. Considered in isolation the Blackberry Z10 is a nice phone, the problem is that nice isn’t enough at this stage. Unfortunately for Blackberry if the Z10 was a party guest it would have arrived 2 hours late, copying fashion trends that were cool before but are no passé. After stepping into the crowd of competing smartphones on the market the pleasant but unremarkable Z10 is quickly forgotten, leaving behind little in terms of specific memories. Blackberry (then called RIM) was for a long time the darling of corporate mobile phone users, who loved the platform’s security features and the signature hardware keyboard that allowed emails to be sent very quickly. Blackberry is a classic example of a company that fatally took the temptation to coast along enjoying the good times. Now they are learning, perhaps too late, how dangerous complacency can be. While the Bring Your Own Device (BYOD) trend has meant a lot of organisations have been forced to allow employees to use their iPhone and Android smartphones at work, Blackberry’s security credentials mean it is still mandatory for some kinds of organisations especially government and defence. While Blackberry rested on its laurels their competitors were quietly innovating and building an army of products to win away seemingly rusted-on Blackberry fans. 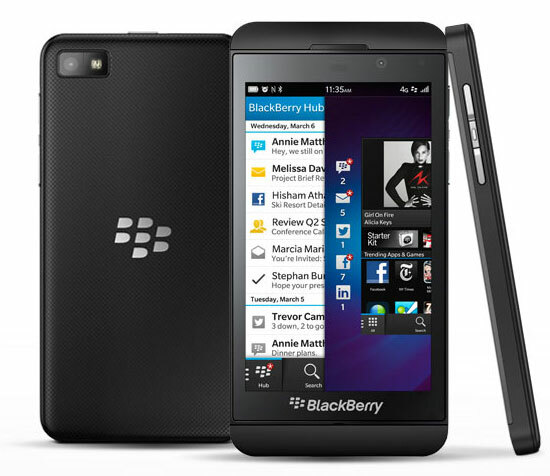 The BlackBerry Z10 strongly resembles a black iPhone 5 in shape with the difference that it doesn’t have any buttons. The Blackberry 10 operating system works by swiping. Swiping down from the top of the screen displays settings, from the bottom of the screen minimises your current app and shows a grid of previously opened apps to switch to or close. Swiping up in a right turn curve opens the Blackberry Hub universal inbox for notifications, call log, messages etc. The BlackBerry Z10’s bright high density 4.2 inch 768×1280 pixel screen makes text on screen appear crisp and easy to read. However it isn’t protected by Corning’s Gorilla Glass so may be more susceptible to scratches or getting smashed if dropped. The back camera is 8 megapixel and provides middle of the road image quality. Call quality using the Optus SIM supplied was alright most of the time but in noisy environments it wasn’t loud enough. The BlackBerry Z10 supports the Optus and Telstra 4G networks but this may be more of a curse than a blessing as using 4G data transfers depletes battery power swiftly and the 1800Mah (removable) battery capacity is woefully small. The Blackberry World app store is a real weakness with many popular apps we use all the time not available for the Blackberry 10 platform including Google Maps, Pandora, Tripview, Shazam, Youtube and Runkeeper. More worrying is that the most popular apps list in the Blackberry World app store contains quite a few . Readers who rely on maps a lot should definitely avoid the Z10 because unfortunately Blackberry Maps lacks Google Maps-like options for walking, cycling and integrated public transport information. The Blackberry Z10 is available from Optus or Telstra, at time of writing it wasn’t listed as an option for Vodafone customers. Previous PostPrevious What Is The Internet Of Things (IOT)?